Our French visitors are currently fifth in the French league and ended last season in the same position, thus qualifying for the Europa League. “With all due respect to teams we have already faced in the competition, Bordeaux are the strongest we have played. We need to put out a team that is strong enough to beat Manchester United on Sunday. As a manager I shy away from saying we are putting out a weaker or stronger team, we always knew the whole squad would have to be used this season”. With Manchester United on Sunday in mind, it seems likely that Ba, Ben Arfa and Tiote will be left out, while it seems very likely that both Cisse and Cabaye may feature, especially with the French midfielder sitting alongside Alan Pardew in the pre-match press conference. 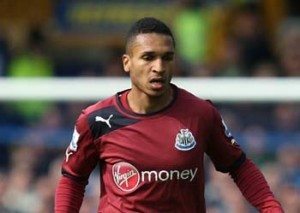 Danny Simpson is back in training and expected to play, while Vurnon Anita is likely to play alongside Cabaye in the middle. There were more than a few puzzled fans when Anita didn’t even come off the bench against Reading and the manager afterwards explained he’d left the Dutchman out because he thought at this stage he might struggle to deal with a high tempo Championship style he anticipated Reading playing. Not sure if I agree with that completely but I assume he will see continental opposition as ideal for Anita to get another match under his belt. One almost familiar face will be ex-mackem, David Bellion, who has been at the French club for five years though he hasn’t been first choice this season. Amazed to see he is only 29 as it seems many moons ago since he was over at the dark side – turns out he left in 2003. Bordeaux are currently on an unbeaten run of seventeen matches so are clearly no mugs, as their 4-0 hammering of Club Brugge backs up. They have won 3 and draw 4 in their league campaign but only managed 9 goals with 5 conceded, though their last match saw an excellent 2-0 win at Lyon. With goals maybe at a premium at both ends my first tip for tonight with BetVictor, is the 28-1 scorecast on Cisse scoring in a 1-0 win. Obertan and Marveaux are once again expected to play and Alan Pardew will be expecting a lot more from both, Marveaux has got into several scoring positions in the Europa matches so far and at 22-1 to score first it must be a sporting bet. Finally, we are going with a 2-0 win for Newcastle at 11-1 with BetVictor. Sign up to BetVictor and get a £25 free matched bet.